Druk Nyamrup Tshogpa’s (DNT) manifesto states its concerns on the inequity of healthcare and the quality of services across the country. DNT want to ensure people receive the best healthcare and services, therefore, ensuring good health for all. The party pointed out that super-specialty medical service is available for those living in Thimphu and to some extent in Mongar and Gelephu. However, the large majority of the people have to do with less than basic services and facilities at district hospitals and BHUs that are deficient, and have not been improved and upgraded for decades, says DNT manifesto. 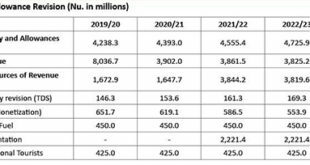 DNT manifesto also states a majority of patients travel long distances to avail themselves of services at the national and regional referral hospitals. A good chunk of their hard earned savings or borrowed money is spent on food and lodging and other expenses. They often wait for weeks or months just to complete a simple medical procedure. According to the manifesto, DNT President, Lotay Tshering, and DNT founder, Tandin Dorji, given their numerous years of experiences in the field of medicine, will ensure that healthcare and its related services are a priority to be fulfilled, should DNT come to power. “Narrowing the gap is DNT’s guiding ray, and therefore, ensuring equal access to quality specialist services for all people, wherever they are, is top priority”, the manifesto states. Party President, Lotey Tshering, said, “When we say or talk about hospital, everyone in the country will only think of JDWNRH which is the only tertiary hospital in the country.” Therefore, he said that, there is a need for bringing in more development in this sector. He also said that every facility should be provided to every nook and corner of the country, otherwise there will be a huge difference between the rich and the poor. He said that since there is no better opportunity and exposures to diagnose any disease, by the time people from rural areas reach the hospital, it is often too late to treat like, kidney failure, gallstone and cancer. “Even if patients are diagnosed early with a gallstone, to treat they have to come all the way to Thimphu hospital for the surgery which would take 3 months and this will cause them a huge financial expenditure, minimum of Nu 30, 000,” said the DNT President. In addition, he said that if the health distribution system remains the same, then after maybe 20 years, the life span will also differ, where the rich will live longer while the poor, who lives far from the health facilities, will have a shorter lifespan. He said that they also pledge to bring in MBBS course in country, and they will also improve the current master’s program in JDWNRH. “We have a plan to make the current hospital into a teaching university hospital and construct a new referral hospital and bring in all the services from Singapore hospital in phase wise,” he added. In the first phase, he said, DNT will bring in the immediate services. The second phase will see the service needed for the long term. All the phases will complete within the next 10 years. 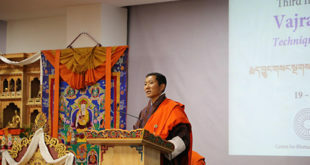 Citing as an example, he said, there is the rising number of cases of infertility in Bhutan and there are no services or facilities like, a dedicated fertility clinic, to render services. In addition, he also said that there is a need for cardiac surgery services and cosmetic surgery facilities which may not take even 5 years to start. The party also pledges to establish a multidisciplinary sub-specialty hospital for tertiary care. “We are aware of the difficulties the patients face when referred abroad for treatment, in terms of meeting living expenses, language barriers and absence of social support that is integral to Bhutanese health care,” DNT said. In addition, DNT said the government spends millions sending patients out of the country for treatment. Therefore, DNT said it will establish a standalone multi-disciplinary super-specialty national referral hospital that provides tertiary care in all branches of medicine. “We will upgrade a few strategic district hospitals with specialist services, which people can avail of within half day and we will also upgrade medical care in BHUs and make specialist services available in gewogs,” DNT said. In addition, they also pledge to build and promote the indigenous medicine system as a center of regional excellence. “Our country has always been hailed as a rich source of medicinal herbs. We will build on our existing indigenous medical system, strengthen and launch it into a world-class institute to make it into a regional centre of excellence in traditional medicine,” DNT added. Likewise, in health sector, DNT pledges to take better care of the health workers and address their needs, strengthen and invest in public health programs, help families care for relatives confined to bed with terminal illnesses. DNT said that nurses are a critical part of health services, and towards upgrading the nursing services, they pledge to create a nursing department, start Master’s program in nursing and establish a nursing college in the south.